Lake Country has added a new pad to their Hydro-Tech line-up: Crimson Finishing Foam. So far, we have the 6.5 inch pad in stock. 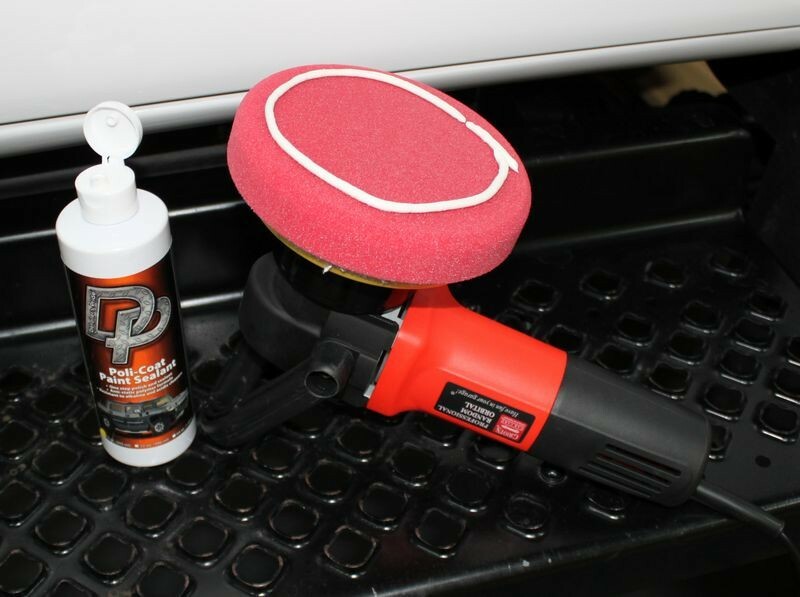 It’s perfect for wax, sealant and glaze application using your dual action polisher. Purchase it alone or in our Hydro-Tech 6.5 Inch Foam Pad 3 Pack. Lake Country Hydro-Tech 6.5 Inch Foam Pads are made of imported European pre-polymer foam. This long-wearing, high quality foam is less absorbent in order to keep the majority of polish on the pad’s surface. You’ll experience a longer working time with your water-based polishes and compounds, resulting in less product used to achieve the perfect finish. Water-based products can soak into some foam pads like, well, water. That requires you to keep reapplying polish to the pad. With Lake Country Hydro-Tech 6.5 Inch Foam Pads, water-based products work longer and you use less. You’ll save time and polish! Click here to see Mike Phillip perform a full detail on a 2004 Custom Kodiak Truck, finished off with the Hydro-Tech Crimson Finishing Pad and DP Poli-Coat Paint Sealant. The Hydro-Tech 6.5 Inch Finishing Pad is available right now at Autogeek.net! Cleaning up your buffing pads is easy when you have the right tools. Below we’ve listed some of our favorite products to clean and maintain foam and wool pads. DP Polishing Pad Rejuvenator is a great value for a great cleaner. It cleans and degreases pads. Just toss your used pads into a mixture of DP Polishing Pad Rejuvenator and water. The solution will do most of the work for you! The Foam Pad Conditioning Brush (shown at left) works well for both foam and wool pads. Use it to agitate the foam pad as it soaks in cleaning solution. The nylon bristles are tough enough to scrub the foam but not so tough that they’ll rip it. You can also use the brush to release caked polish from the pad face during the detailing process. 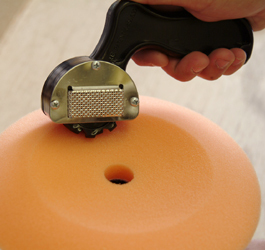 The Duo Spur Wool & Foam Pad Cleaning Tool (shown at right) cleans and levels pads. Levels? Isn’t that what you’re using the pads to do to your paint? Yes, that’s true. But the Duo Spur actually levels the pads when they become unbalanced. A cheese grater-like plate on each side of the Duo Spur reshapes warped foam pads. Three wheels with raised teeth push excess polish out of the pad to restore an effective texture. Speaking of spurring tools, the Lake Country Wool Pad Spur (shown at left) is new at Autogeek.net. This tool has pointier teeth to really dig into wool pads and separate those fibers that like to get matted. It takes just a few seconds to break up caked on polish and restore the wool texture while the pad is still on the machine. The Wool Pad Spur is a simple but handy tool for anyone who uses wool pads. Finally, if you really like to let your buffer do the work, you’ll like the Grit Guard Universal Pad Washer (shown at left) and the Autogeek System 2000 Pad Washer? (shown at right). Both pad washers are designed to clean a pad while it is still on the polisher. Internal mechanisms pump cleaning fluid up to the pad and agitate it as it spins on the polisher. The Grit Guard Pad Washer works with dual action and rotary polishers. The Autogeek System 2000 Pad Washer is designed exclusively for rotary polishers.